Zapier is a system that enables integration between a wide range of applications and cloud-based services. It is a “universal plug” of sorts, through which you can connect ActiveTrail to any other system that you make use of, without any disruptions, automatically, and free of any dependence on code development or API programming. Imagine the following scenario: a new client register via a sign-up form that you created in ActiveTrail and their personal information is automatically saved to a previously designated group within your ActiveTrail account, but not to your CRM or lead generation systems. Well… please meet a new and more efficient way of doing things: ActiveTrail’s Zapier integration allows you to create a “ZAP” between ActiveTrail and your lead generation or CRM systems that will automatically pass on any new lead directly into account in your other systems. Using Zapier, you can connect your ActiveTrail account to a very wide range of systems from any discipline. For instance, you can connect to CMS systems (such as WordPress), cloud-based solutions (e.g. Google Sheets), CRM systems (e.g. Salesforce), lead generation systems (e.g. Pipedrive), website builders (e.g. Wix), e-commerce systems (e.g. Magento) and many more first-rate applications. Of course, ActiveTrail sports an easy to use and user-friendly API, RESTful API, for developers wishing to create integrations with third-party systems. However, the ultimate solution for those who are not interested in or do not have the know-how to develop their own API integrations, is Zapier, which enables connectivity between ActiveTrail and almost any other system. 1. Sign up and login to your Zapier and ActiveTrail accounts. 2. Connect ActiveTrail to your Zapier account (using a token generated from the ActiveTrail system). 4. Watch the magic unfold. ActiveTrail’s integration with Zapier can increase your sales, strengthen your ties with your customers and maximize your return on investment. Would you like more information about Zapier integration? 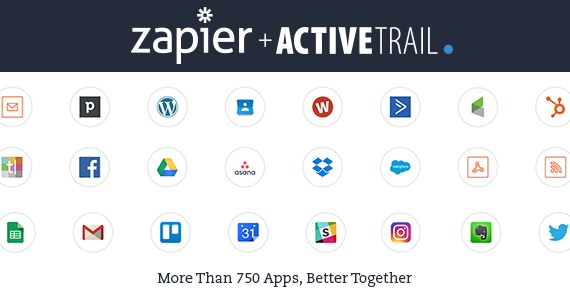 Read more on our blog: How to Integrate ActiveTrail with Any System- Using Zapier! Call us and speak to our outstanding support team +1-212-203-0074.